A beautiful yard is not just about the appearance from a distance, it also needs to be pest free. If your kids or pets love to play in the yard, it is a good idea to keep the area tick free. Ticks thrive in places that are damp and leafy with lots of shade. If this sounds a lot like your garden or yard, you need to be careful to ensure that you have pest free grounds. Ticks may be tiny but they can cause some major issues including causing Lyme disease. Your health and that of your family is very important and there are things that you should do to turn your yard into a tick-free zone. It is important to find out what ticks look like so that you know whether you have a problem. It is very easy to miss a tick if you do not know what it looks like or what to look for. It is important to know that the age and species of the tick will determine its appearance. Try to get information about the characteristics or features of the ticks that are found in your region. While you are at it, learn about other pests so that you know exactly what you are dealing with. Your lawn maintenance habits can determine whether your yard is conducive for the pests. Mowing your grass close to the ground is a good way to keep it tick-free. Tall grass creates the perfect hiding spot for the hungry ticks and the cover protects them from sight and sunlight. The annoying critters hide in the long grass as they wait for a passing human or animal to climb on. Mowing your grass on a regular basis will discourage the ticks from setting up camp in areas where you might walk into them. It is important to know that ticks keep away from dry areas and surfaces like gravel where they are exposed to sunlight. Creating a gravel or mulch barrier between your yard and any wooded area is a great way to keep away the pests. The ticks will not want to travel over the dry path and you can get the relief that you need while enhancing your landscape. You can create sections of your yard keeping the areas that experience human and pet traffic separate. If there are some wet spots in your yard, you should find a way to dry them out. Ticks prefer wet and cool environments and keeping your yard’s moisture level under control is important. You can trim back bushes and shrubs to let more sunlight filter to the ground. Inspect the grounds to identify and deal with any areas that are prone to dampness such as close to the home’s foundation or near stonewalls. These areas provide shade and moisture. Keep out animals and pests that are tick carriers. The ticks often climb on furry pests and rats and the only way to keep the menace under control is to have a complete pest control policy. 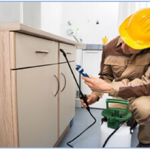 Talk to the pest control expert about a comprehensive plan to rid your property of all pests.